10/10/2010 - Another victory for team Lucidi Motors was harvested at Mugello in the seventh and penultimate round of the Italian Formula 3 Championship. The driver from Monaco Stephane Richelmi, after the seventh time in qualifying (1'43.079) has been protagonist of a spectacular recovery which took him to the second place under the chequered flag, position that was kept in the second race too. The weekend was certainly positive for Sergio Campana as well, who set the fourth fastest time in qualifying (1'42.851). After getting on the podium in race one, the driver from Modena obtained the victory in race two, which came after the success harvested two weeks ago at Vallelunga. He was also the author of the fastest lap of the race. Giammarco Raimondo obtained the rookies podium as he finished tenth absolute and second of the rookies in race two, after the retirement in race one. Richelmi is now second in the classification at 142 points, just six short of the lead. Campana is fifth at 94 while Raimondo is fourth of the rookies with 104 points, ten shy of the third position. "This has been an absolutely positive weekend for our colours. The whole team is giving the maximum in this tight season finale and on Wednesday we will be again on track at Monza for the last collective test. We will face the last round of the season as we did with all the others and we will delineate the balance of our 2010 only after race two's chequered flag". 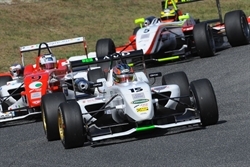 The Italian Formula 3 Championship will be back on track next 24 October at Monza for the final round of the season.